Our Work - Benchdog Construction Corp.
We worked on this project with one of the city’s most celebrated architects to convert a brownstone two-flat into an upscale, contemporary single family home. During the renovation, we removed the rear masonry wall of the building and entirely replaced it with an architectural window wall. 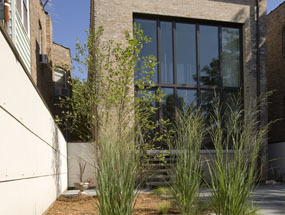 We used custom cabinetry within an open floor plan to complete the vision of the owner and architect, and the end result was a beautiful and unique conversion from a multi-unit building to a single family home.